I am geeked. I have loved Short’s beer since I first came across it a few years back, and I’ve been wanting to get to their Bellaire pub (what I call “the Motherland”) for a long time. It’s quite the drive, however, even if you’re already in Traverse City. Luckily, we have some free time between movies at the Traverse City Film Festival and our group is surprisingly receptive to my suggestion we have lunch at Short’s. Score! We arrive and find street parking nearby, with no problems. Bellaire seems to be much like your typical small, sleepy northern Michigan town. We head inside to the pub. One side is an open expanse of tables and booths, while the other half hosts the bar and more tables. After some initial confusion, we discover we need to order food and drink at the bar, then it will be shuttled to us. I get a sampler including tastes of their ContraversiALE (single-hopped IPA); Autumn Ale (ESB); Jezzebelly (dry-hopped pale ale); Nicie Spicie (wheat with coriander, peppercorns, and citrus); Village Reserve (a Californian ale); and India Spruce Pilsner. The spruce is my favorite because I love “weird” beers and this tastes almost like drinking a Christmas tree. Pilsner is fun to play with because it mingles well with both fruit and vegetation additives. Ever since studying their menu online, I’ve been craving a pizza. Specifically, we’ve all been craving Mutiliated Lips, a pie topped with marinara, mozzarella, Italian sausage, pepperoni, black olives, green pepper, fresh mushrooms and red onion. It sounds incredible. Unfortunately, it comes out kind of bland. The toppings are fresh, but kind of ho-hum. Likewise, the crust is plain, borderline tasteless. I glance at the condiment tray already on our table and spy the ultimate food-saver: Cholula! A few splashes of my preferred hot sauce and the pizza comes back from the dead long enough for me to crush another piece. Crisis: averted. Still, with another round of beers on the way, I have room for a couple more bites. The specials of the day are displayed on a chalkboard and two are irrestible: mac-n-cheese and The Fruit Man. The pasta has green chilis in a white cheddar sauce. It is nicely balanced with just the right amount of heat. The Fruit Man is a mango BBQ meatball sandwich with caramelized onions and provolone cheese on a hoagie roll. And it is glorious! Spicy, sweet, and meaty...we all attack it with forks until there is absolutely nothing left. When we leave, we take a growler of The Magician, along with a few six-packs of Soft Parade, Huma Lupa Licious, and Bellaire Brown. Despite the pizza snafu, we truly enjoy our first experience at Short’s. It remains one of my favorite Michigan breweries. Next time I hope they have Funkin Punkin and PB&J Stout on tap. There’s an afternoon lull in our moviegoing schedule during the Traverse City Film Festival so Jeremy suggests we visit Short’s Brewing Company for an impromptu lunch. I’m not a huge beer drinker, nearly always ordering wine or a cocktail over a pint, but I enjoy Short’s inventiveness, especially their summer brews. A scenic drive to Bellaire on a sunny day strikes the group as the perfect break to sitting in a dark theatre, so we strike out. The drive is indeed gorgeous, though the hot sun and purr of the Prius causes me to doze off briefly. (What am I...82?) Forty minutes later we arrive in downtown Bellaire and find parking just down the block from Short’s. The acoustics inside the pub are horrendous; we can barely hear the waitress as she explains we have to place our orders in the other room at the counter. It’s so loud I have to repeat what our waitress told us twice to Jeremy. (What is he...82?) Once we get our bearings, we grab a high-top table and the boys place beer and food orders. I have a pint of Nicie Spicie, a wheat beer with lots of citrus and a light peppercorn undertone. We mulled over the online menu before heading out and it was unanimous that we’d try the “Mutilated Lips” pizza. Topped with marinara, mozzarella, Italian sausage, pepperoni, black olives, green pepper, fresh mushrooms and red onion, it sounds divine to all of us. 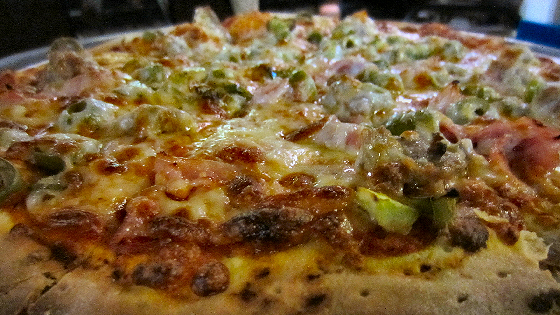 We dig in as soon as it arrives, anticipating pizza nirvana, only to find it’s...just okay. The crust is nearly flavorless, almost like store-bought pre-fab crust. Same for the marinara; it’s nothing special at all. I assumed this being a brewpub, the crust would contain spent grain and the marinara would sport a beer infusion. No such luck. Now, the toppings and the cheese are lovely. I’m not a big green pepper fan, usually finding them too bitter for my palate. But I’m actually wishing for more green peppers on this pizza, maybe to give it a kick? Our foursome polishes the pie off quickly, then Jeremy surprises us with an appetizer-sized portion of the daily mac and cheese special (this one has green chilies in it) and the daily sub—a mini meatball sub with mango barbecue sauce and caramelized onions. I had been fancying the mac ‘n cheese and this one does not disappoint. The pasta still has a bit of bite. The cheese sauce is sharp and pungent. The chilies add slight heat and the panko breadcrumbs are buttery and crunchy. I might be in love! Jeremy manages to cut the small sub into four portions. The meatballs are tender and sweet smothered in the fruity barbeque sauce. It pairs really well with my second pint of Nicie Spicie. It’s John’s turn to surprise us with a stash of bottled beer and a growler to go! We head south for more movies and hopefully later tonight, more Short’s beer. @GRMAGAZINE: Why Did The Chef Cross The Road?